In 1733, Willam Kent, an architect from England, was attributed with the invention of baby carriage technology, though the original versions of this contraption were quite different from those around today. Kent created this for the children of the 3rd Duke of Devonshire. He was asked to create a transportation device to bring amusement to the young ones. The first model was intended to be pulled by a goat or small pony. 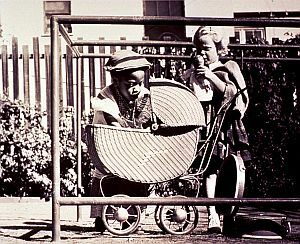 It consisted of a basket with a shell-like shape for children to sit in, affixed to large spoked wheels underneath. Not only was it a big hit, but it also influenced a trend that followed. It was not long before royal families began to consider the possession of a baby carriage to be a symbol of status and something that could not be done without. A century after William Kent built the first unit, by the early 1840’s, the popularity of the baby carriage was in full swing. Even at this time, the transportation device was less than entirely safe for use. However, that did not stop high society from embracing it with open arms, and in droves. United States innovator Charles Burton came up with a new concept in 1848 for the baby carriage. He placed handles on them so that they could be used by parents to push their children around. This was not accepted in the US at first, and so Burton proceeded to try his idea overseas in England. There his version was welcomed by Queens of the time and they hired him. A new type of baby carriage arose again later that century, in 1889 when William Richardson registered a patent for the reversible stroller. It was the first of its kind. This enabled parents to face towards or away from the baby in the bassinet. Modifications to the structure of the unit were also instituted in this design. Due to separate movement of the wheels of the carriage for the first time, parents were able to make turns more easily. In the 1920’s, baby carriages were becoming somewhat of a norm to society. Safety was also being implemented with brakes, stronger frames, and enlarged wheels. Aeronautical engineer Owen Maclaren constructed the first umbrella stroller in 1965. It was made with an aluminum frame and its light weight form allowed it to be folded up in a compact manner and pushed around more easily. Maclaren’s understanding of airplanes helped him create the new model. At this point, strollers using this design began being used all over the world. In 1980, Phil Baechler created a Baby Jogger style of baby carriage. He wanted to be able to take his son along with him when he went on runs. Knowing the wheels on the existing stroller he had would be no match for this much wear and tear, he used the wheels a bicycle to make the stroller stronger. Since that time, now in the modern era, strollers are safer and more well constructed than ever before.